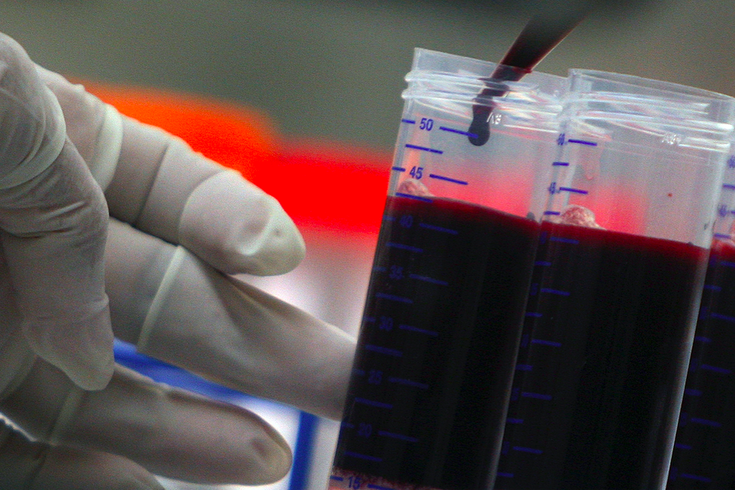 A doctor works with blood samples used for research in a experimental vaccine against HIV in Santo Domingo, Nov. 30, 2006. Researchers at the University of Pennsylvania are developing a new animal testing method that will improve the quality of results that inform efforts to create an effective vaccination for HIV. Hematology researchers at the Perelman School of Medicine modified a genetically engineered virus that can be introduced to rhesus monkeys in order to mimic the viral and immune response of HIV infection in human beings — an incredible challenge given the frequent mutations that insulate HIV from replication in vaccines. In order for preventive vaccines to work at their best, they must present either non-infectious or weakened forms of a microbe to a host's immune cells, in turn prepping the creation of antibodies equipped to defeat the most virulent strains of the infection. HIV's disguised nature makes it all the more potent: the virus is delivered in an envelope coated with host sugar molecules that block the immune system's recognition of an invader. Despite recent progress in HIV vaccine development, researchers have not been able to effectively test their work on animal models that reliably simulate the human response. While the immune system of rhesus monkies is comparable to that in humans, HIV can't properly infect and replicate in the species. Only with genetically engineered simian-human immunodeficiency viruses (SHIVs) can rhesus monkeys be infected with a virus that is both contained in an HIV envelope and capable of producing an AIDS-like disease. The innovation of artificial SHIVs, however, has faltered at the point where the HIV envelope has to bind to virus' primary receptor, a molecule known as CD4. The SHIVs component of the agent consequently loses its natural defenses to antibodies and provides an inaccurate response for vaccine researchers. To address this problem, hematology experts George M. Shaw and Hui Li altered a single amino acid that preserves the characteristics of both viruses vital to produce meaningful vaccine research. Their "designer SHIVs" enabled sugars and proteins from the virus and the host — contained in one envelope — to deliver genes to host cells and replicate the infection. “We found that changing a single amino acid in the envelope coat protein of naturally occurring HIV strains led to dramatic differences in the ability of SHIVs to infect monkeys, while at the same time retaining the native-like features of the virus envelope and its interaction with the human immune system,” Shaw said. In effect, the modified virus induces a human-like immune response while still infecting the rhesus monkeys with a virus that summons protective antibodies. In the form of a vaccine, this allows researchers to test whether antibodies to SHIVs can get past the disguised envelope structure of HIV. “This is an enabling discovery for the HIV vaccine field because it allows scientists for the first time to study in a controlled and reproducible manner the interaction of natural HIV envelope proteins with monkey B lymphocytes, which are stimulated to make protective antibodies,” Li said. The study, published in the Proceedings of the Natural Academy of Sciences, will act as a springboard to evaluate how the molecular pathways of HIV envelopes and neutralizing antibodies evolve in humans and rhesus monkeys. “These results have given us hope that the new SHIVs will indeed be a game-changer for HIV vaccine research,” Shaw said. "The SHIVs replicated persistently at concentrations comparable to HIV-1 levels in humans and elicited neutralizing antibody responses typical of HIV-1."